Gulf Shores Shopping: Clothing, Souvenirs, Art & More! What Gulf Seafood Is in Season in Spring? The Gulf Shores offers a range of sites and activities for all its visitors, and it seems that none is more attractive than the fresh Alabama seafood available at most local restaurants. Whether your favorite is red snapper, royal red shrimp, local crab, oysters, or one of the many other offerings, you'll find plenty of opportunities to indulge in some local delights. The national shrimp festival is a tradition that dates back more than forty years, and this year we'll see the annual tradition continue. There's no cover, so the whole family can enjoy Alabama Wild Shrimp while listening to live entertainment and participating in one of the many competitions that surround the event. Make the best sand sculpture or run in the 5k, all while eating some of the best shrimp in the country. Oysters are delicious fried, grilled, on the half shell, whole shell, pretty much any way you can prepare them. Alabama offers some of the freshest, most incredible tasting oysters on the east coast. What's more, wild Alabama oysters are particularly healthy. A one cup serving offers over 17 grams of protein, and you'll also get your daily serving of iron from them. The Gulf Shores is home to four distinct ecosystems, each with its own contribution of wildlife. It is no wonder that the Shores has such remarkable biodiversity, and is home to 4,500 different species. Of those, 144 can only be found in the state of Alabama, and another 100 are deemed globally rare. Exploring the wildlife at the Gulf will produce an experience that is unparalleled in any other region. As an incredible winter catch, don't be put off by the whiskers you may see on the Black Drum's chin. These fish love oyster reefs and muddy floors, and actually vary in taste depending on their size. The general agreement is the puppy drums (less than 10 pounds) are the tastiest. On the hard shell or soft shell, Alabama crabs are often a fisherman's favorite find. 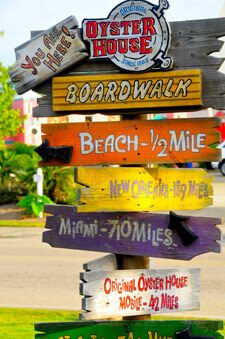 Cast off from one of our Orange Beach rentals and hunt for your own! Though if you prefer the soft shell kind, you may want to leave it to the professionals. There's only about a 4 hour window to catch a soft shell crab before their exoskeleton hardens and you've got a hard shell one. Alabama is home to both King and Spanish Mackerels, weighing an average of 10 and 3 pounds, respectively. Their abundance and variation in size makes them the perfect target for a family fishing trip. Both types love the open water, though you're likely to find the Spanish variety a little closer to the beach. Plan to come back to Alabama's Gulf Shores time and time again so you get the chance to try each variety of fish freshly caught from the coast. This is just a sampling of what the Shores have to offer. Take a look at the comprehensive list of choices, and you'll be left with just one possible reaction - Holy Mackerel.